This article looks at the WW2 years and which period may contain possible ghosted Mandrake and The Phantom stories. In October 1941, Archibald MacLeish was appointed director of the "Office of Facts and Figures" (OFF), an independent government information agency. To head the "Foreign Language Division" (FLD) within the OFF MacLeish chosed Alan M. Cranston [footnotes 1]. Cranston wanted Lee Falk[footnotes 2] to serve as associate chief and handling radio[footnotes 3] issues. In Cranston's letter inducing Falk to take the job, he explained that Falk would: compose radio scripts for use in foreign-language broadcast designed to provide information about the war, to boost morale, and to sell the war to the German, Italian, and other groups in this country. 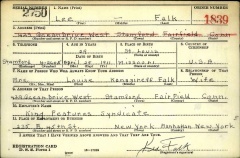 Early[footnotes 4] 1942 Lee Falk started his work at FLD in Washington. He established a close collaboration with OFF Radio Division, attending their weekly radio conferences with committees of agencies, stations and networks. He also established collaboration with the Broadcasters Victory Council, setting up an exchange-of-program-ideas service. A new program "Uncle Sam Speaks" was scheduled for WOV in New York in Italian, later reproduced in German (and English). During[footnotes 5] the NAB Convention in Cleveland Lee Falk explained how enemy interests were attemting to capitalize on foreign tongue programs The broadcasters set up a temporary committee to set up a organization of self regulation, where all personnel should be clared through this committee (Foreign Language Broadcasters Wartime Control). Lee Falk agreed to act as liaison between the committee and the various Governmental agencies identiffied with or interested in foreign language broadcasting. Included the Office of Cencorship, Federal Bureau of Investigation, intelligence branche of the Armey and Navy, and OFF. "Office of War Information" (OWI) was established as a federal agency on June 13 1942, to conduct the government's wartime information and propaganda programs. OWI came into being by integrating several agencies — including the OFF, with the FLD as part of the Buerau of Special Operations, headed by Philip Hamblet. By 1943 Congress made a varity of accusations against the OWI, as a political tool, and began its investigation. A more specific accusation involving the work of the Radio Section of the FLD and its head, Lee Falk. The inquiry, chaired by Edward E. Cox, claimed that in addition to the initiated moral- and unit-building foreign-language programs they also removed from the air broadcasters who were considered pro-fascist. The Cox Committee claimed that radio stationes were pressed to dismiss personnel by holding the treat of license suspension over their heads, attendent to force upon radiostations a pro-Russian or an arbitrary OWI slant, and that Falk used the division to secure publicity for himself and employment for his friends. The inquiry started in August (1943) and by the end of the month Lee Falk had quietly quit his job at OWI. In Washington Lee Falk was one of several dollar-a-year men, and his income was from his newspaper strips. In 1948, Phil Davis said that Lee Falk did mail two or three months' supply at a time. In 1967, Lee Falk said he created a few weeks of script for both Mandrake and The Phantom at a time, spending eight to ten hours a week on this. Even if Lee Falk probably worked long days in Washington he could continuing writing his script for Mandrake and The Phantom. Also several scripts in this period are about the war theme and intelligence, inspired by his work at OFF/OWI. By the end of August 1943 Lee Falk had quit his job in Washington and back in New York he wrote the Passionate Congressman, inspired by his experiences in Washington's political environment. He also worked feverishly plotting and writing an army-term-lenght supply of Mandrake and The Phantom. He was enlisted with no branch assignment at Fort Devens (Massachusetts) on Mars 7, 1944. Lee Falk himself said that he promptly was shipped from one end of the country to another. 12 times he was on the verge of going overseas, and 12 times the orders were cancelled and he was sent to some other post. He also said he most of the time as a private and almost all of the time on KP. cont Fort Devens and other ? ↑ Lee Falk's friend and collaborator of "The Big Story"
↑ In the newspaper strip of June 30, 1942 there is an interesting real-time connection. Mandrake is talking about a new job, some sort of espionage, in Washington!